Liverpool legend Jamie Carragher has been left raving over English duo James Milner and Jordan Henderson for their game changing impact in the Reds’ win over Southampton on Friday. The duo started the clash on the substitutes’ bench, seeing their side go into half time at 1-1 with the Saints, Naby Keita cancelling out Shane Long’s early opener at St Mary’s. 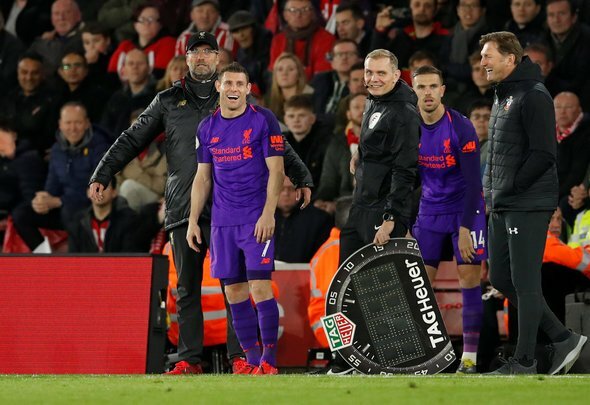 Coming onto the pitch on the hour mark, both Milner and Henderson were deployed in surprise positions – the former at right back and the latter in a much more advanced role than usual – and despite this twist Carragher was impressed with what he saw. Asked about the impact of the two English internationals, he told Sky Sports’ coverage (05/04, 22:00): “Massive, they were. I thought the energy Jordan Henderson provided as soon as he came on was a big difference. Liverpool’s passing at times in the game was too slow and lethargic and he just upped the tempo. “Also bringing James Milner on, maybe people thing a strange one, Trent (Alexander-Arnold) created the goal, but there was problems coming down that side at times. I think it was just a case of getting senior professionals on the pitch, no matter the sort of positions they were in – Jordan didn’t play his normal holding role. They say you cannot teach an old dog new tricks but it seems as though the experienced midfield stalwarts are willing to give it a go. Yes, both have played in those positions in the past but they are definitely not where they would prefer to be playing, with the duo much more comfortable operating in a deeper midfield role. It was either a stroke of genius or a lucky roll of the dice from Klopp that their arrival into the game turned it on its head but that is why managers are paid the money they are. His decision making saw Southampton’s attack nullified somewhat down Liverpool’s right flank, Milner much more composed and defensive minded than the man he replaced, while Henderson brought vigour and urgency to their passing in the midfield and the final third. The fact he assisted a goal and scored another shows just how much of an impact he had – whether he starts a game in such a role any time soon remains to be seen though.